Family Life: Russell Banks's first novel is an adult fairy tale of a royal family in a mythical contemporary kingdom where the myriad dramas of domesticity blend with an outrageous slew of murders, mayhem, coups, debauches, world tours, and love in all guises, transcendent or otherwise. Hamilton Stark: This tale of a solitary, boorish, misanthropic New Hampshire pipe fitter—the sole inhabitant of the house from which he evicted his own mother—is at once a compelling meditation on identity and a thoroughly engaging story of life on the cold edge of New England. 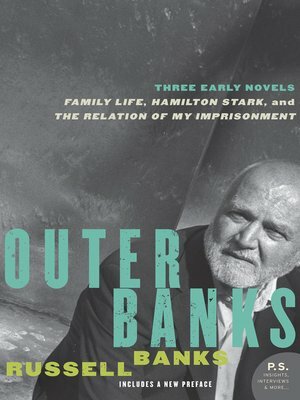 The Relation of My Imprisonment: Utilizing a form invented by imprisoned seventeenth-century Puritan divines—an utterly sincere and detailed, if highly artificial, recounting of great suffering—Banks's novel is a remarkably inventive, lovingly good-humored argument, exploration, and map of the caged religious mind.